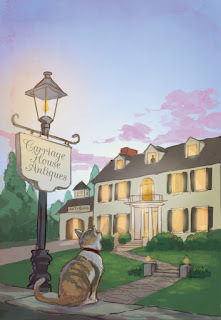 This is a cover for the "Antique Shop Mysteries" series from Annie's Publishing. 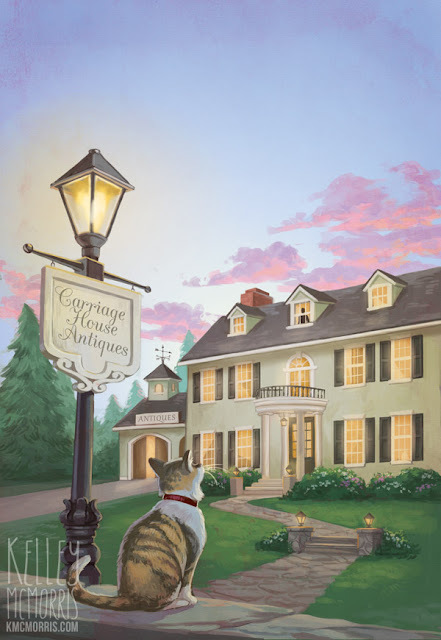 If you haven't seen my previous cozy mystery blog posts, cozy mystery covers tend to have a quaint, small-town setting, a hobby theme, and a "sinister element" that suggests danger. A Colonial Revival mansion with adjacent carriage house located on a wooded, seaside estate in New England. The carriage house has been turned into a busy antique store filled with rare finds. The shop or a partial view of it near the rear side of the mansion. Include a small sign on it that says "Antiques." An old fashioned gas lamp in the foreground with a hanging sign that says "Carriage House Antiques." 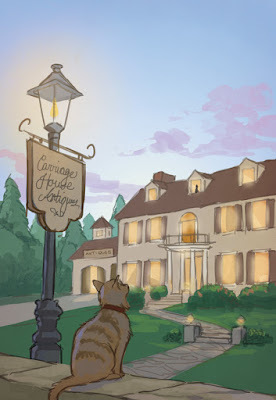 A brownish/ black striped cat somewhere in the scene. 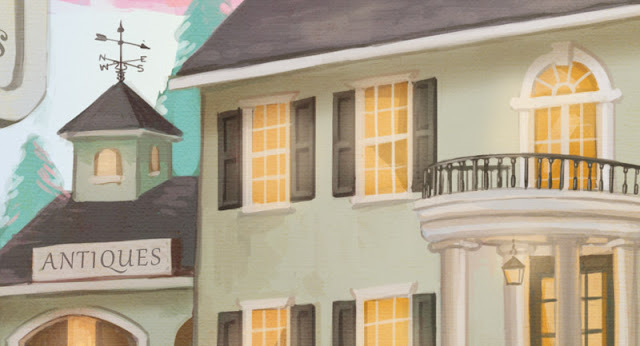 The "mystery element" will be a silhouette in a lit attic window. This is the part where I tend to get a little panicky. How am I going to fit two buildings on a book cover? Two?? Surely such a thing cannot be done! 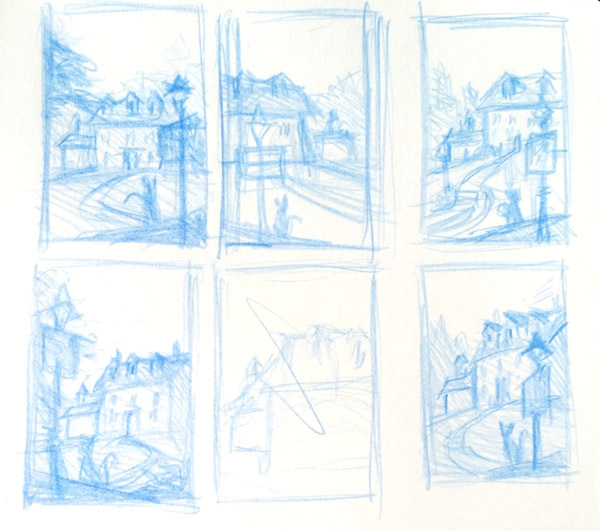 "This is madness," I whisper as I scribble out thumbnails. "Madness." Here are the roughs I sent to the client. Since a figure needed to be silhouetted in the window, that meant that the lights needed to be on in the house - so it couldn't be in the middle of the day. Since this client likes their covers to be bright and colorful, I chose to set it in the evening rather than at night - dark enough that the lights in the house would glow, but not too dark. The client liked rough #2, with some revisions. They asked for a stone wall in the foreground, a sitting cat, and for the cat to be wearing a collar. 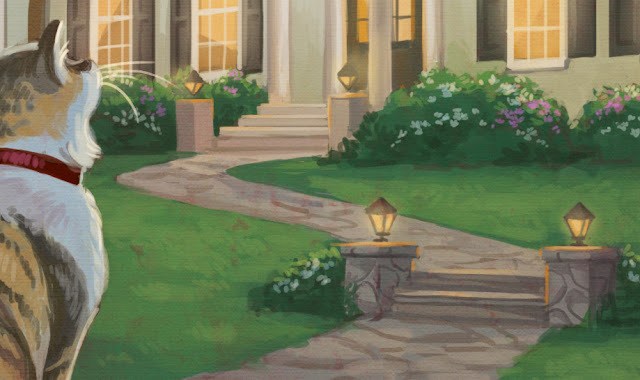 They asked for more pine trees, more landscaped flowers, more space in the sky, and a grander entrance to the mansion. The AD said there was too much brown going on in this color rough (looking back, she was totally right), so we tried out a few different colors for the cat, the sign and the roof. She liked the last one, the dark grey roof, the best. I was clear to go to final. I put quite a lot of polish into this one! I painted this cover over a year ago, and I haven't looked at it since then. Last month this book arrived in the mail, and I thought, "Dang, that's a pretty sweet cover." 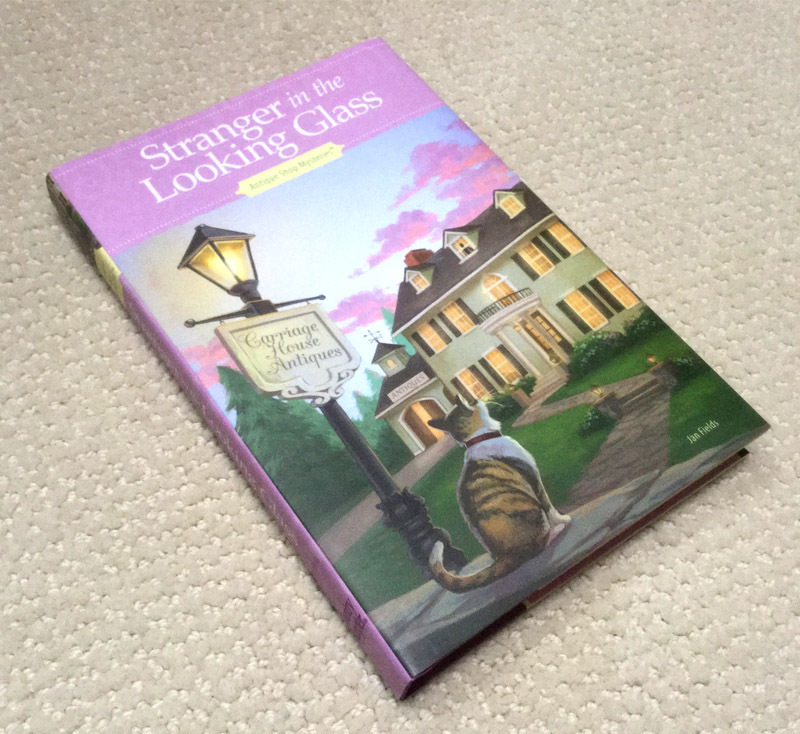 Annie's Publishing always does such a lovely job on the book design. I like how they picked a pink accent color from the sunset. So yeah, I'm rather proud of this one, if I do say so myself. If you would like to subscribe to any of Annie's fiction mysteries series, you can do so at their website. I love how the cat's tail is animated (Flicking) if you look at the roof color variants. Was that intentional?